I simply love strawberries.. and chocolates. And who doesn't? But how would the combination be of both? Yes, just super yummy (add all other adjectives). The simple way to make this is by the use of melted chocolates/ nutella. Wash the strawberries and pat dry. Keep aside. Heat nutella in a microwave for about 10 seconds, till it is of a bit of liquid consistency. You can also melt dark chocolates in the microwave. Do not microwave for long, or it might burn. 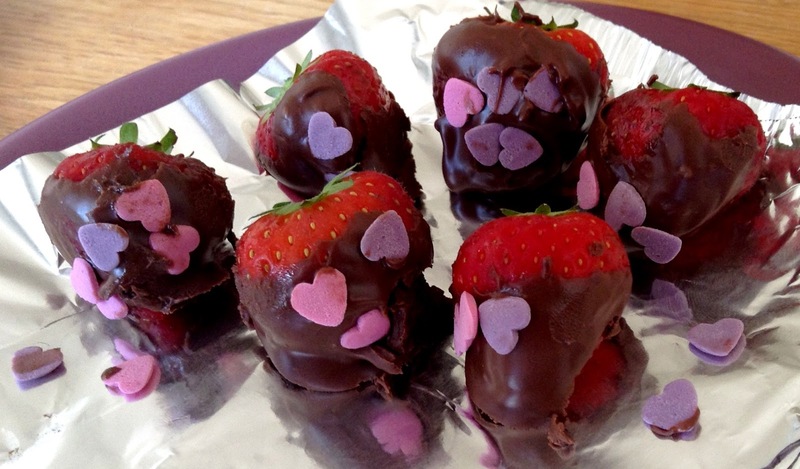 Roll all the strawberries in the melted chocolate and keep on aluminium foil/butter paper. Add edible toppings if you want. Set in the refrigerator to set for about an hour. Take out and savour.